After an unprecedented lack of volatility in 2017, volatility returned to U.S. equity markets in the first quarter of 2018. To give this some perspective, the S&P 500 Index did not experience a single down day of more than 2.0% during the entire year in 2017, which compares to seven down days of 2% or more during the three months ended March 31, 2018. Although the return of market volatility can be unsettling at times, we would caution investors to not confuse short-term market volatility with long-term secular risk when it comes to investing in common stocks. Furthermore, we see the recent market correction as a healthy mechanism to help keep valuations in check and remove complacency from investor sentiment. Despite the long anticipated process of the Fed normalizing interest rates, numerous geopolitical threats, and continuous rhetoric over a potential global trade war, we still see the economic backdrop for earnings growth among many U.S. corporations as favorable. As a result, the investment team at Hodges Capital Management has positioned our portfolios to benefit from broader economic growth and earnings improvement across a wide number of sectors. We believe an improved outlook for earnings in 2018 should be supported by a more business-friendly tax and regulatory environment, as well as solid global economic activity. As a result, we see compelling investment opportunities in many of the cyclical areas of the market such as financials, consumer discretionary, technology, healthcare, and industrials, which have the most earnings upside potential in the current environment. By contrast, we see less long-term opportunities in utilities, telecom, and consumer staples which had benefited the most from low interest rates and a flight to “safety” in recent years. Today there is no shortage of uncertainties impacting capital markets; however the one thing that we know for certain is that we do not know what the market is going to do on a day to day basis. Furthermore, we are not attempting to forecast or market time interest rates, currency fluctuations, or commodity prices. Instead, we believe this is an ideal time to scrutinize the fundamentals of individual companies. Although not true for every company, we see the potential for upward earnings momentum for many of the companies in our portfolios which can be supported by improved pricing power, lower taxes, and the benefits of greater consumption. Recent discussions with a number of corporate management teams also suggest that higher profits and the repatriation of overseas cash should bode well for new capital investments, as well as share buybacks and dividends over the next twelve to eighteen months. As always, we are making a conscious effort to remain objective and open-minded in our buy and sell decisions, while continuously looking for new opportunities around every corner. Furthermore, we believe that there are many high quality companies running great businesses with excellent management teams that are still trading at bargain prices. Despite the market’s rally in 2017, we still find U.S. equity valuations reasonable with the S&P 500 Index trading at 16.1X forward earnings estimates according to FactSet. The inverse of this multiple is an earnings yield around 6.21%, compared to the 10-year treasury yield of 2.74% at the end of the recent quarter. We believe this risk premium indicates that the potential reward for holding stocks still outweighs the underlying downside risk potential. The research team at Hodges Capital Management continues to rigorously gather and analyze firsthand information from a broad scope of publicly traded companies. Here are a few worthwhile observations. First, most management teams seem generally confident regarding the prospects for demand growth, pricing power, potential margin improvement and earnings growth this year. Second, balance sheets are generally in good shape, allowing many corporations to continue to reinvest in capital projects, make strategic acquisitions, buy back shares and historically pay dividends. Lastly, we do not see the typical signals (such as a buildup of inventories) that would be conducive to a coming recession in 2018. We do see some inflationary cost pressures, such as labor and transportation costs, in the supply channels for certain industries that are consistent with the latter stages of an economic cycle. In many cases, the bottom-line impact from such costs is more than offset by price increases, as well as the benefits from recent tax reform. Given the current backdrop of rising interest rates, we would be surprised to see the Price/Earnings multiple for the average U.S. stock expand meaningfully in the remainder of 2018. However, we see further gains in the market being supported by earnings growth and stable multiples for most of the economically sensitive sectors of the market. In the midst of increased market volatility, we are rigorously looking for investments in well-run businesses that control their own destiny by relying on ingenuity and well-calculated business decisions. Although the macro conditions and political headlines can seem overwhelming at times, we always fall back to the idea that the long-term performance of stock prices is determined by the future earnings and cash flows of each underlying business. In conclusion, we see the remainder of 2018 as an ideal environment for active portfolio managers to carefully select individual stocks that we believe can generate long-term value for shareholders. During the first quarter of 2018, the Hodges Small Cap Fund experienced a modest positive return of 0.67% versus a negative return of 0.08% for the Russell 2000 Index. Positive relative performance in the most recent quarter reflected strength in many of the Fund’s cyclical, financial and material related stocks. For the 12 months ended March 31, 2018, the Fund generated a return of 12.49% compared to 11.79% for the Russell 2000 Index. Improved relative performance during the past couple of quarters was attributed to the Fund’s overweight exposure in many of the same cyclical related stocks that caused the fund to underperform during the second half of 2016 and the first half of 2017. While hindsight clearly suggests we were a bit early in our portfolio positioning, we remain concentrated in our highest conviction stocks that we believe will drive performance over the next twelve to eighteen months. In the midst of heightened market volatility; we believe there are many small cap stocks that can outperform in a rising rate environment as earnings growth increases at a faster pace than inflation. Furthermore, the fact that money is not rushing back into bonds and defensive stocks is, in our opinion, a positive sign for the small cap stocks. The Hodges Small Cap Fund remains well diversified across industrials, transportation, financial services, technology, and consumer-related names, which we expect could contribute to the Fund's long-term performance. The Fund has recently taken profits in several stocks that appeared fairly valued relative to their underlying fundamentals, and established several new positions in stocks that we view as having an attractive risk/reward profile. The total number of stocks held in the Fund at the end of the recent quarter was 48 compared to 47 at the beginning of the quarter. The top ten holdings at the end of the quarter represented 41% of the Fund's holdings and included Texas Pacific Land Trust (TPL), Encore Wire (WIRE), Nutanix, Inc. (NTNX), Eagle Materials Inc. (EXP), United States Steel (X), RSP Permian (RSPP), Legacy Texas Financial Group (LTXB), Hilltop Holdings Inc. (HTH), American Eagle Outfitters (AEO), and Spirit Airlines (SAVE). The Hodges Fund's first quarter 2018 return amounted to a loss of 2.22% compared to a loss of 0.76% for the S&P 500 Index. Negative relative performance in the recent quarter was largely attributed to weakness in several energy related holdings in the portfolio. 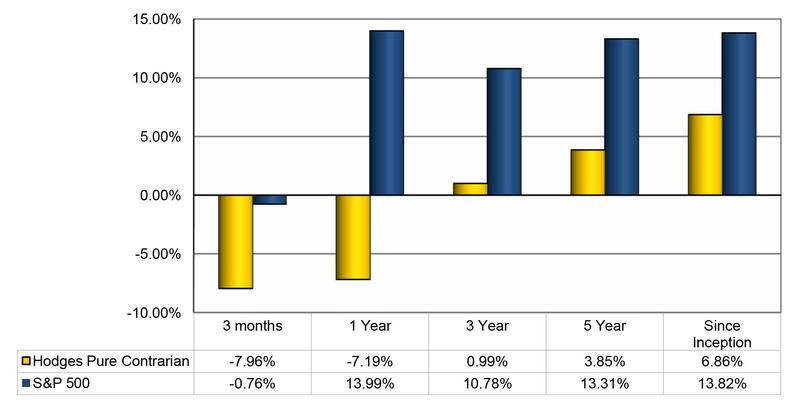 The one year return for the Hodges Fund for the 12 months ended March 31 was 11.88% versus 13.99% for the S&P 500 Index. The Hodges Fund remains focused on investments where we have the highest conviction. The number of positions held in the Fund at the end of the recent quarter was 38. During the first calendar quarter of 2018, we took profits in a few stocks that appeared to offer less additional upside potential relative to their downside risk, increased the size of several positions where we have increased conviction, and entered into several new positions. For example, the Hodges Fund exited its position in Kapstone Paper & Packaging (KS), after the Company entered into an agreement to be acquired by Westrock (WRK) at a premium of more than 30%. The Fund also entered into several new positions in the recent quarter such as home improvement retailer Floor & Décor (FND), and Dropbox (DBX) which completed an initial public offering. Top ten holdings at the end of the quarter represented 44% of the Fund's holdings and included Nutanix, Inc. (NTNX), Square (SQ), Micron Technology Inc. (MU), Ring Energy Inc. (REI), Commercial Metal (CMC), United States Steel Corporation (X), Eagle Materials Inc. (EXP), Floor & Décor (FND), Encore Wire (WIRE), and American Airlines Group (AAL). The Hodges Blue Chip Equity Income Fund experienced a loss of 2.91% in the first quarter of 2018 compared to a loss of 0.69% for the Russell 1000 Index. For the trailing twelve months, the fund experienced a total return of 13.69% compared to a 13.98% return for the Russell 1000 Index. Negative performance relative to the benchmark in the recent quarter largely reflected weakness in several of the Fund’s high quality industrial and technology stocks. Looking ahead, we seek to find plenty of attractive high quality dividend-paying stocks that offer upside potential in addition to dividend income as stable corporate profits support the ability of companies to pay out dividends. The Blue Chip Equity Income portfolio remains well diversified in companies that we believe can generate above average income and total returns on a risk adjusted basis. Top ten holdings at the end of the quarter represented 46% of the Fund's holdings and included Boeing (BA), The Home Depot, Inc. (HD), Apple Inc. (AAPL), Microsoft Corporation (MSFT), Facebook (FB), Delta Air Lines Inc. (DAL), Union Pacific Corporation (UNP), Citigroup Inc. (C), Johnson & Johnson (JNJ), and Visa Inc. (V). The Hodges Pure Contrarian Fund was down 7.96% in the most recent quarter compared to a decline of 0.76% for the S&P 500 Index. For the twelve months ended March 31, 2018 the fund was down 7.19% compared to a gain of 13.99% for the S&P 500 Index. The Fund’s significant underperformance over the past twelve months has been largely attributed to several turnaround situations that demonstrated limited progress. The three largest detractors to the fund over the past year have been retailer J.C. Penney (JCP), energy producer Comstock Resources (CRK), and Mexican airline Volaris (VLRS). Although timing a recovery in contrarian stocks can be tricky over short periods of time, we believe this strategy could be rewarding over a long investment horizon. We also expect this strategy to be less correlated with the broader market due to the general nature of contrarian investing. During the recent quarter, we continued to position the Fund in out-of-favor investment opportunities that we believe offer the best upside potential relative to their downside potential. Top ten holdings included Ring Energy (REI), Comstock Resources (CRK), Twitter Inc. (TWTR), Tapestry (TPR), Gogo Inc. (GOGO), United Continental Holdings (UAL), Cleveland-Cliffs Inc. (CLF), Luby’s Inc. (LUB) JC Penney (JCP), and American Eagle Outfitters (AEO). The top 10 stocks in the Fund at the end of the quarter represented 51% of the fund's holdings. 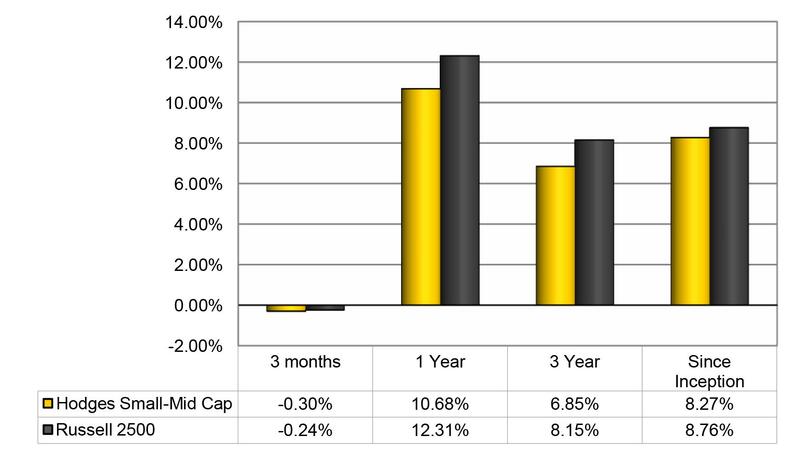 For the first quarter of 2018, the Hodges Small-Mid Cap Fund experienced a loss of 0.30% compared to a loss of 0.24% for the Russell 2500 Index. For the twelve months ended March 31, 2018, the Fund experienced a return of 10.68% compared to a gain of 12.31% for the Russell 2500 Index. The Fund’s lackluster relative performance over the past twelve months partly attributed to a handful of energy stocks, which have underperformed on a relative basis. Top ten holdings at the end of the year represented 47% of the Fund's holdings and included Nutanix Inc. (NTNX), Conn’s Inc. (CONN), WPX Energy (WPX), QEP Resources Inc. (QEP), Comerica Inc. (CMA), Norwegian Cruise Line Holdings Ltd (NCLH), Eagle Materials Inc. (EXP), Teladoc Inc. (TDOC), Skechers USA Inc. (SKX), and Select Energy Services Inc. (WTTR). The Hodges Small Intrinsic Value Fund experienced a loss of 1.73% in the March quarter of 2018 compared to a loss of 2.64% for its benchmark, the Russell 2000 Value Index. 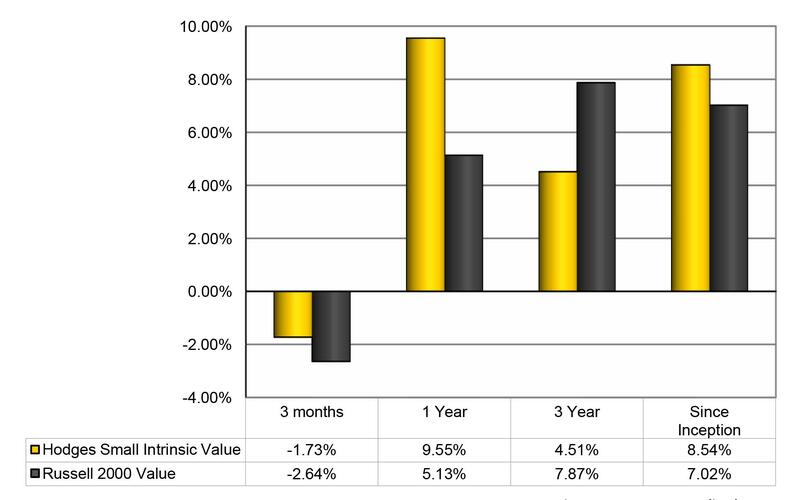 The return over the twelve months ended March 31, 2018, amounted to 9.55% compared to a 5.13% return for the Russell 2000 Value. The Fund’s positive relative performance over the past year has largely been attributed to the Fund’s individual stock selection among several technology, industrial, and financial names in the portfolio. The top ten holdings at year end represented 36% of the Fund's holdings and included Triumph Bancorp (TBK), Nuvectra (NVTR), Eagle Materials Inc. (EXP), Encore Wire (WIRE), EZCORP Inc. (EZPW), Propetro (PUMP), Commercial Metals Company (CMC), Integrated Device Technology (IDTI), Ring Energy (REI), and Century Communities Inc. (CCS). Mutual fund investing involves risk. Principal loss is possible. Investments in foreign securities involve greater volatility and political, economic and currency risks and differences in accounting methods. These risks are greater for investments in emerging markets. Options and future contracts have the risks of unlimited losses of the underlying holdings due to unanticipated market movements and failure to correctly predict the direction of securities prices, interest rates and currency exchange rates. These risks may be greater than risks associated with more traditional investments. Short sales of securities involve the risk that losses may exceed the original amount invested. Investments in debt securities typically decrease in value when interest rates rise. This risk is usually greater for longer term debt securities. Investments in small and medium capitalization companies involve additional risks such as limited liquidity and greater volatility. Funds that are non-diversified are more exposed to individual stock volatility than a diversified fund. Investments in companies that demonstrate special situations or turnarounds, meaning companies that have experienced significant business problems but are believed to have favorable prospects for recovery, involve greater risk. Value investing carries the risk that the market will not recognize a security’s inherent value for a long time, or that a stock judged to be undervalued may actually be appropriately priced or overvalued. Price/Earnings Multiple: The most common measure of how expensive a stock is.